We offer: A variety of sheet sizes to fit your crib, play yard or bassinet. We specialize in custom sizing for unique bassinets, vintage cradles, round cribs, oval cribs, and standard cribs etc. We make halo bassinet sheets, guava lotus sheets, arms reach sheets, stokke mini sheets and bedding, leander cradle sheets and bedding, heirloom cradles sheets and bedding, joovy sheets, uppababy vista, 4moms breeze bassinet and play yard sheets, baby bjorn cradle and travel lite sheets, moses basket sheets and any other size bassinet or cradle. As well as bedding for the mini crib, stokke system, and standard crib. Don't see an option for your bed? Just message us and we will make a custom listing for you! We offer many different products including minky blankets, changing covers, crib bedding sets, boppy covers, Dockatot covers and Snuggle Me covers and much more in other listings message me if you have trouble finding them. See sizing and descriptions below. Please read entire listing for a full understanding of our product. You will be in love with how cute these DockATot deluxe, + and Grand covers are! Little Moose By Liza designed a 100% cotton, very user friendly and washable cover. It has a handle on the side for ease of carrying around. It has a large tie at the bottom to adjust the bottom of the cover, that can be tied in a bow or knot for extra style. An envelope style closure on the back of the cover makes it easy to slide the bottom pad in as well as any type of waterproof mat you might want to use for protection. There is a zipper 3/4 of the way around the tube so that you can remove the cover for easy washing. Not to mention these fabrics are oh-so-soft against your baby's sweet skin! The Deluxe Cover fits the Deluxe and Deluxe + forms from DockaTot, the only difference is the Deluxe + Covers have loops for the toy bar they sell. If you would like to add loops onto your cover, please message me and it will be an additional $10. You can choose fabrics from any of our fabric listings, including our organic section, the pricing may change with your fabric choice. A variety of products can be made from these fabrics. Please select your choice in the drop down menu. If there is a fabric that is not listed please do not hesitate to ask because we might be able to order it in! Customize your own bedding set by selecting the item(s) you are wanting in the drop down menu. If you want multiple items you will need to add each item to your cart with your fabric # selection. Then you may check out and add any additional notes to me in the "Notes to Seller" box on the checkout page. If you have different dimensions than what are listed below, you want to specify fabric, or feel like it would be easier to just tell me your order and create a custom listing, please feel free to message me! All the sheets are fitted (unless flat is stated) and have corners sewn with a French seams so there are no raw edges anywhere on the crib sheet. This prevents fraying and has a clean and sophisticated look. Elastic is sewn into hem with a serged stitch all the way around allowing the elastic to stretch with the fabric preventing the elastic from breaking over time. These fitted sheets will be a snug, perfect fit for your mattress! These crib sheets will add a trendy pop of color for your baby's nursery and will have them sleeping in eco-friendly cuteness and comfort. Please check your mattress dimensions below to ensure that your mattress will fit our sheets. If your mattress is different please message me for a custom listing, I will get back to you quickly! I offer two styles of blankets, the minky blanket or comforter. I offer a baby minky blanket (28x34), which has 100% cotton on one side and soft minky on the backside. 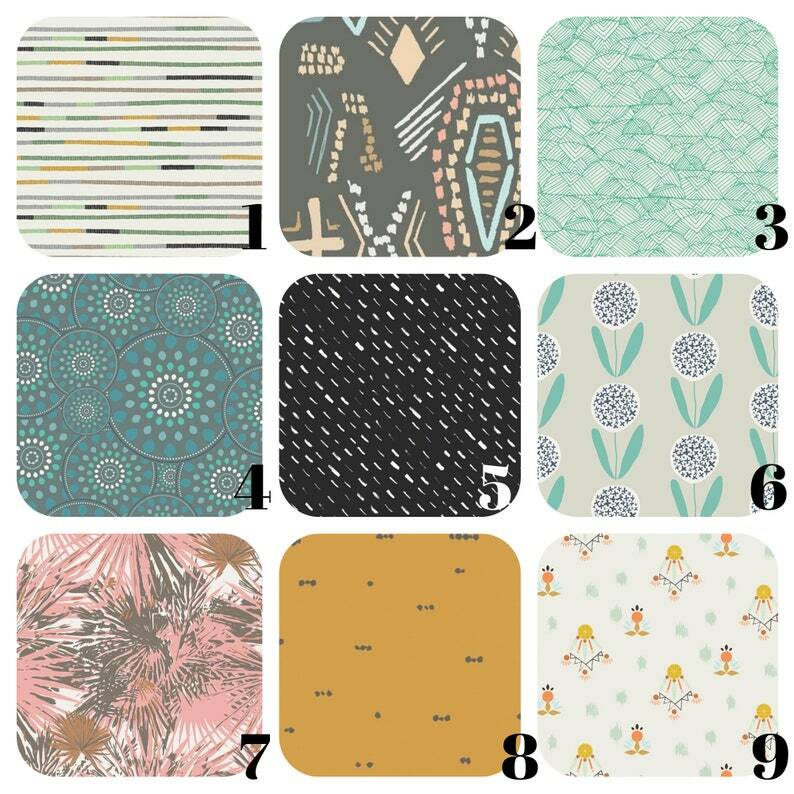 You can specify what color minky you would like in the comments section at checkout (white, ivory, silver, charcoal, coral, light pink, mint, aqua, lavender). The toddler size is 34x42. The crib comforter is 100% cotton on each side with a fluffy batting on the inside (34x42). The toddler comforter size is 42x52. You can ask for a custom size or a duvet, please message me for a custom listing. We also make patchwork comforters or blankets, only in size 34x42. You can choose 4 patterns, one of these will also be the border (please note these in the comments box). You can choose either a coordinating solid, a pattern used on the front of the blanket or an additional pattern, or a minky. If you would like more clarification on this please message me and I can set up a custom listing. These covers are made to fit the Bare Naked Boppy Pillow or the Boppy Newborn Lounger. These are a snug fit, with a 22” zipper. These are washable and will hold up to constant use. The Reversible Minky Boppy and the Boppy Lounger has one side minky and one side cotton, please specify your minky color choice in the "notes to seller" box on the checkout page or we will choose a coordinating minky. Our standard crib skirt is the 3-sided box-pleat crib skirt. You may also choose a crib skirt with a coordinating 3" border along the bottom, a gathered crib skirt or a 4-sided crib skirt for $20 more than our standard crib skirt. Pictures of these are available in the “Updates” tab in our shop. We also make a crib skirt for the Stokke Mini and Stokke Sleepi Crib. All of these options are available in the drop down menu. Our standard skirt is 3-sided, if you need a 4-sided skirt you may select it in the drop down menu or message me for a custom listing. Our crib skirts have a 14" drop (please message me for a custom size drop, there may be an up-charge if we have to order additional fabric). A white panel fits under the mattress to hold the skirt securely in place. There are slits in the corners to cover the brackets of your crib. These are professionally serged, with a double hem on the bottom to create a nice weight which allows the skirt to hang beautifully! If you need different dimensions please message me and I will create a custom listing. Here is a picture of our crib skirt and rail covers. We use a 6-piece style set for the standard crib. We use Nu-foam which is a breathable foam batting. You can choose one overall pattern or you can choose two patterns to have one on the inside and one on the outside of the bumper. You can also choose a coordinating pattern or solid for the piping (which is only on the top side of the bumper). We use only grosgrain Offray ribbon and seal the ends to prevent fraying (this has been tested thoroughly and upholds the test of washing and wearing well). These bumpers have zippers on the bottom side of the bumper so you can remove the batting to wash. We recommend washing on cold and gentle cycle and laying flat to dry so they do not shrink. Please do not wash the batting as we cannot guarantee the outcome. You can select one of your pattern choices in the drop down menu. Please leave your other instructions in the "notes to seller" box on the checkout page. You may list your preference of ribbon color, or we will choose the best coordinating match with your bedding. You can select 1, 2, 3 or 4 rail covers. This will depend on the style of crib you have. The long rail cover is 8"x52", the short rail covers are 8"x27" (if you need your rail covers wider please message me to see if you need a custom listing). You can specify which color ribbon you would like used for the ties or I can choose for you if you do not have a preference, we offer: white, ivory, light pink, peach, coral, navy, gold, gray, mint. We also offer rail covers for Mini Cribs, and the Stokke Sleepi System, please contact me for a custom listing. All of our valences or curtain panels have a 3" encasing on the top. We do not do tabs or grommets at this time. If you need a larger encasing please let me know. I offer valences 15"x42", lined. Our standard size curtain panel is 42"x84", we sell these unlined, lined, or blackout. Unlined means there is no backing on the panel, just the back of the fabric. This is a fine option if you already have shades, and the least expensive choice. Lined curtains have a wrinkle-free, stain-free white lining on the back of the fabric, this creates a nice weight to the curtain, filters out some light and temperature and prevents fading. Our blackout panels are meant to block-out the sun and offer moderate temperature and noise control. These are very heavy so please be sure to have a sturdy rod. If you need a different length (we cannot make these any wider than 42") please message me for a custom listing and I will adjust the price accordingly by the amount of fabric needed. You will be in love with how cute these DockATot deluxe, + and Grand covers are! Little Moose By Liza designed a 100% cotton, very user friendly and washable cover. It has a handle on the side for ease of carrying around. It has a large tie at the bottom to adjust the bottom of the cover, that can be tied in a bow or knot for extra style. An envelope style closure on the back of the cover makes it easy to slide the bottom pad in as well as any type of waterproof mat you might want to use for protection. There is a zipper 3/4 of the way around the tube so that you can remove the cover for easy washing. Not to mention these fabrics are oh-so-soft against your baby's sweet skin! The Deluxe Cover fits the Deluxe and Deluxe + forms from DockaTot, the only difference is the Deluxe + Covers have loops for the toy bar they sell. If you would like to add loops onto your cover, please message me and it will be an additional $10. You can choose fabrics from any of our fabric listings, including our organic section, the pricing may change with your fabric choice. Message me for a custom listing. We are excited to offer you a new option for your DockATot deluxe! Little Moose By Liza now has a slipcover that you will slide your DockATot with a cover into. There is a zipper around the top so that you can easily remove the cover for washing. It has a handle on the side for easy carrying. In the rare occasion we cannot complete a rush order we will refund this amount to you. Please message me with questions, thanks! If this your first order through Little Moose By Liza? Please like my Facebook page Facebook.com/littlemoosebyliza or follow me on instagram @littlemoosebyliza and favorite my Etsy store and use the code FIRSTFREESHIP for domestic free shipping or use INTERNATIONALSHIP10 if you are international. Are you a return customer? Kindly review my products and you will receive a 10% off discount on your next order. If you leave a shareable picture with the review you will get a code for 15% off your next order. Or you can also use a free shipping code as a return customer. Please take a minute to review our return/exchange/refund policies before you purchase. If you have any questions at all please message me. Arrived super late, feels very cheap. I actually came back into my account and can’t believe this cost me $35... very disappointed. We offer a variety of custom sizes for baby bedding and we are happy to help you design your hand-picked baby bedding. Please do not hesitate to ask if we can help with a certain product. If you have a custom size sheet, for example, a bassinet sheet that is different than the mattress size dimensions in the "Item Details" portion of the listing, please select "bassinet sheet" and then leave your dimensions and any additional details in the "notes to seller" box. We will then customize the sheet to fit your mattress. Please message me with any questions or concerns. This is 34x42 only (at this time). You may choose up to 4 different patterns for the patchwork front of the comforter. You may choose a solid color backing or another pattern for the reverse side (for a small upcharge), these blankets have fluffy batting in the middle (like a comforter). Or you may choose a minky backing, which is a coverlet weight. We do sell crib bumpers now for mini cribs, standard cribs and stokke cribs. This option has not been added yet to every listing so please message me for a custom listing. We use a 4-peice or a 6-peice model depending on your need. We use a product called Nu-Foam that is breathable, sealed grosgain ribbon tie and piping is included in pricing. You may choose one fabric or two fabrics (for reversible), pricing is the same. Please message me with any questions. Please note that while we make these products as safe as possible, we do recommend caution when using bumpers or any object placed in the crib, as this can become a safety risk. Check out our products at Amazon and Wayfair for faster turnaround times. Search "Little Moose By Liza" in their search bar. We typically operate on a 2-3 week processing time. This is because orders are fulfilled in the order they were placed, and we typically have over 100 open orders at a time. Every item is handmade and made-to-order. This allows us to offer you an extensive amount of fabric options to choose from. Some of our fabric collections will take 3-4 weeks, simply because it takes longer to get those fabrics in. We have a section of our shop labeled "In Stock Fabrics 1-2 weeks". These fabrics are what we have in-house. Or you can purchase a rush order.